I feed a wide variety of brands, foods and formats in the girls' rotation diet, and I enjoy being able to mix things up. I always add fresh food, goat milk and an oil supplement to their kibble meals every other night, along with some kind of topper. 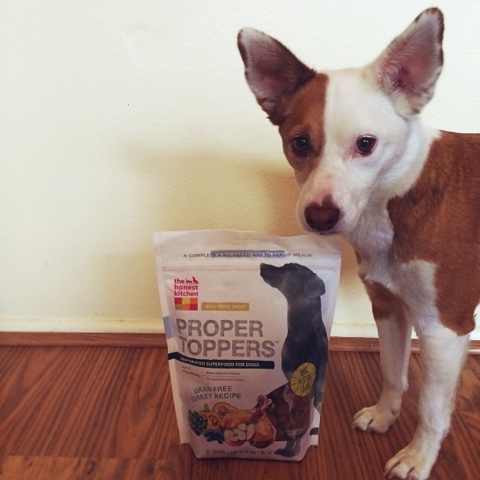 Proper Toppers fit the bill as they are made with a mere five healthy ingredients melded together in easy-to-feed morsels- think of it as doggie granola (without the grain)! We tried the turkey variety, which contains free-range turkey, pumpkin, blueberries, apples and chard - that even sounds good to me, if I ate turkey. 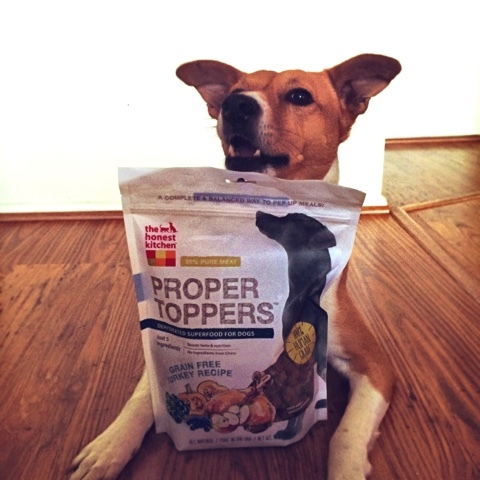 Proper Toppers are 90% meat and can even be used as a complete meal, albeit a pricey one. 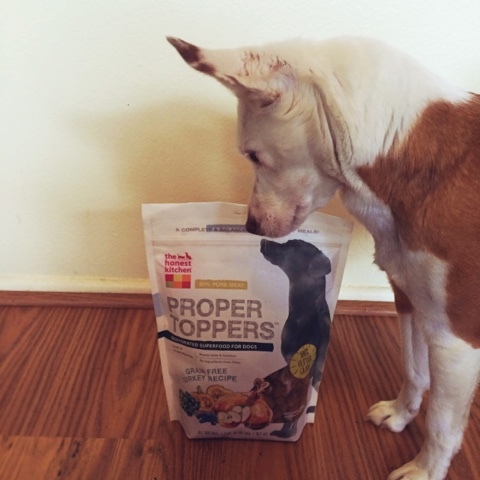 The clusters hold together well and could be used as training treats without issue. Ruby and Boca expected their payment in Proper Toppers as soon as we were done taking pictures, and I've been feeding them along with their kibble meals all week. I'm not at all surprised to have another great offering from The Honest Kitchen! 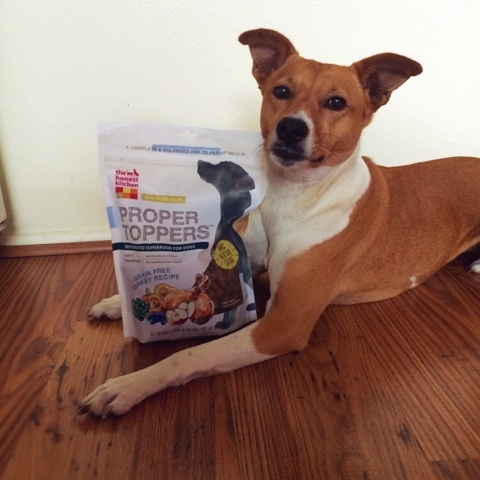 Do you ever use a kibble topper? 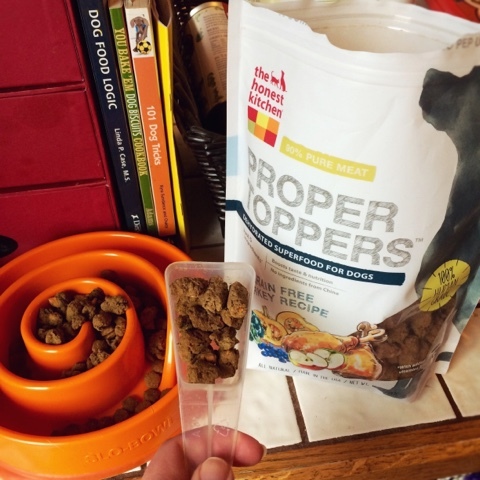 Disclaimer: I was provided The Honest Kitchen Proper Toppers in exchange for my honest review.All opinions expressed are my own and I only publish reviews for products I feel comfortable using in the day to day life of my pets. These work great for treats! I always use a kibble topper! Usually cooked meat and some vegs in a little broth because options are so limited here. But I will look into these. Just, for me, shipping costs are prohibitive. It'll be interesting to see if this line grows. If The Honest Kitchen provides a fish option, I'll be placing an order. I want to try these as a dry treat for my dogs but are they really hard or sharp? My dogs are small and one has esophageal issues and we can't do very hard foods. Thanks.